It’s been a while since our last post where Wiggo and Cav were leaving home shores to support Chris Froome in his tilt at the world championships in Tuscany. Ahead of that Sir Brad was heading for his seasons goal (if we all forget about the Giro) of the individual time trial. Would he assist Froome in the road race a few days later and what exactly would Cavendish be doing, other than proudly representing his country. VCSE isn’t aware if there was a representative from every nation on the globe at this years world championships, but in the category for ‘country with quite a lot going on at the moment..’ Syria managed to enter a rider in the men’s Elite TT on the fourth day of the week long cycling festival in the Tuscan hills. Nazir Jaser propped up the field in 77th place, which isn’t the point really. While you ask, “How does he manage to train?”, if not where it’s worth noting that last place was only a shade over 15 minutes behind the winning time of Tony Martin and his average speed over the 57.86km course was nearly 43kph. We will never know if would have beaten the two Ugandan entrants as unfortunately they did not start. The much trailed match up between the (relative) elder statesmen of the test, Wiggins and Cancellara, was won by the Englishman. This was the undercard though; Tony Martin was the man to beat from the earliest of time checks and Wiggins second place suggested both riders were peaking at just the right time. Cancellara had opted not to take time information (neither had Wiggins), but the battle for second and third places seemed to come down to his fast out of the starters hut approach verses Wiggins slow(er) build to a peak in the final quarter. Wiggins has been less bullish as the sands of this years racing have ebbed away and seems more comfortable with the fact that he has been beaten by the better man, at least in terms of performance on the bike by Martin and perhaps psychologically earlier this year by Froome as he lost his number one status at Sky. Cancellara had bested Martin in the Vuelta as Wiggins in turn had beaten the Radioshack rider in Poland shortly after the Tour. The edge that each protagonist sought over his rivals ebbed and flowed as the main event approached. There is a sense of drama, even in what is to some people the dullest of cycling disciplines when watching Wiggins or Cancellara. Martin however is a metronome, even if below the skinsuit and aero helmet the physical and mental toll is playing just as viscerally for him. As Martin took more than 15 minutes out of our Syrian friend Jaser so he took the best part of a minute out of Cancellara and Wiggins. The Sky rider who had gone to Tuscany to win announced that he was “..happy with second”. 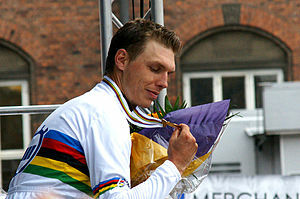 Watching Tony Martin that day who could have doubted he meant it. As it must have been when Eddy Merckx was at his peak Marianne Vos’ name on the start sheet casts a long shadow over the rest of the field. That she began the Elite Women’s Road Race as favourite was unsurprising. Of more interest as the race started was the race strategy of some teams to deploy almost their entire teams to try and beat the dominant rider in the field. First the Americans and as the race reached the final stages the Italian team attempted to set a pace to try and split the field and tire out, if not Vos then her Dutch teammates. The climbs that suggested the possibility of a GC contender taking the men’s race the following day played their part in the womens’s race also as the sole remaining US rider Evelyn Stevens attacked on the penultimate climb. This wasn’t the final ascent of the Mur de Huy in the 2012 Fleche Wallone and the small advantage gained was soon gathered in by the remaining group. Arguably it was the Italians who held the most cards, with three riders the largest group by nationality in the selection. But it was Vos who attacked on the final Salviati climb a short, straight and steep ribbon of freshly laid tarmac covered in so many fan’s messages they had become almost indecipherable. The ease with which Vos reached, overtook and then rode away from her rivals left you wondering if you had just seen every other rider drop the heads and concede the race there and then. There had been no shortage of effort thus far and the selection contained some of the greatest female riders currently racing. Did the fact that she made it look so easy, so effortless sow an immediate seed of self doubt that Vos could not be beaten. You cannot dislike Marianne Vos, despite her dominance. Her joy as she crossed the line was not because of the margin or nature of her victory. In her mind this was another milestone, a back to back world title. Her search for the next milestone may take her into other disciplines next year (mountain biking is rumoured), but surely the next challenge for the road would be a hat-trick of rainbow jerseys on the road. Helicopter and wide angle tracking shots were not in evidence or in fact possible for Sunday’s Elite Men’s Road Race. The heavy rain that had characterised much of the Giro created conditions that meant that the selections and abandonments from the peloton came on each of the ten laps of the Florentine circuit the women had raced the day before. Mark Cavendish’s role was of hare to the hounds of the peloton the strategy of the British team and those countries protecting a GC type rider to try and exhaust the classics specialists like last years champion Philippe Gilbert and Fabian Cancellara. The pace, perhaps more so the weather, led to the early abandonment of many of the field as riders got dropped and decided it was infinitely preferable to be inside and wearing something other than sodden cycling gear. Chris Froome’s tilt at the title was possibly not as serious as he suggested, although he hadn’t shown much form on his return to racing in the continental US. Ultimately, the entire GB squad got off their bikes and the suggestion afterwards that the race had been used as preparation for the Olympics two years hence was as welcome as the Italian weather. A Froome in better form might have been able to freelance to a better place, even if a win was unlikely. The win was taken by this years medium mountain specialist, the winner of the Tour de Suisse and two stages at the Tour Rui Costa. He had been in a the select group of riders left contesting the race on the final lap that also included his Movistar teammate Alejandro Valverde (Spain), Italy’s Vincenzo Nibali and Valverde’s compatriot Joaquim Rodriguez. There was almost an even split of GC to classics riders with Gilbert and Cancellara joined by Peter Sagan and Simon Clarke. As with the women’s race the day previously the Italian’s had some strength in numbers as the finish approached and Nibali seemed well placed if not in a position to dominate the selection. If anything there was an echo of his performances in the Vuelta where he seemed to lack that final 5% that had made him so strong in the Giro. Would this have told at the line? No, Nibali slipped off in the wet and was left to contest a placing. Ahead Rodriguez had attacked and was doing his approximation of time trialing to the finish with Costa in pursuit. Purito might have expected fellow countryman Valverde to cover Costa. Although they were trade teammates at Movistar, Costa had already announced a one year deal with Lampre. Surely, Valverde wouldn’t be complicit in letting Costa catch Rodriguez? Costa had shown his strength in the final kilometres of a race in France in July and he reached Rodriguez’s wheel with time to spare. The little Spaniard and the Portuguese engaged in conversation. It’s not unknown for one rider to offer an inducement (read bribe) at this point to throw the race. Purito may just have enquired if Valverde had put up any fight at all to prevent Costa from getting away. Based on the relative ease with which Costa had caught him it wasn’t much of a surprise that the seemingly perennial runner up Rodriguez continued his run of podiums while Costa took the win. Purito, who can seem happier with a second or third than many race winners was more subdued this time, a mixture of bafflement and frustration with third place man Valverde. Nibali was an anticlimatic fourth with a “disappointed” Cancellara rounding out the top ten, one place behind last years winner Gilbert. The world championships coincided with the UCI presidential elections, also held in Tuscany so delegates could be reminded of what it’s all meant to be about. VCSE hasn’t covered much of the political side of the sport and won’t subject you, the dear reader, to much more than a summary here. Incumbent Pat McQuaid had been on shaky ground ever since the USADA ‘reasoned decision’ that led to Lance Armstrong’s lifetime ban and stripping of his Tour titles. Even if McQuaid’s handling of the Armstrong affair in particular and the wider question of doping in the sport had been blemish free he couldn’t escape his associations with the Armstrong era. His position was further undermined by the impressive grassroots campaign to overturn his presidential nomination in Ireland and the subsequent messy attempts to get an endorsement from other nations. Brian Cookson had emerged as his rival after initally endorsing McQuaid. Cookson’s campaign looked well managed in comparison to McQuaid’s, but concerns surfaced about Cookson’s tactics as the contest drew closer. Ultimately, cycling decided on at least the appearance of a break from the past. The rise in prominence of the sport in the UK during Cookson’s time at the helm of British Cycling would be good news for potential sponsors if he is able to raise the profile of cycling in an equally positive way in the next few years. Like McQuaid, he will be judged first and foremost by how he deals with the legacy, if not the current issues of doping within the sport. Early signs are good with the promise of a closer relationship with WADA and suggestions of some kind of ‘truth and reconciliation’ process. Cookson has shown himself to be a pragmatist by offering to reduce Armstrong’s lifetime ban in return for him lifting the lid on his doping (Armstrong, at least publically, has so far refused to name names). While Armstrong is the tip of the iceberg, it’s the lack of a coherent approach to previous and existing dopers like Danilo Di Luca that cause concern. Should anyone caught doping get a lifetime ban? Precedent in other sports suggests not, although multiple offences equaling a life ban seem to be accepted as an appropriate response. The standards applied to ‘irregularities’ also seem inconsistent and many riders can be misplaced into the category of dopers where there can be other reasons for this. It’s interesting to compare the current situation of Sky’s Jonathan Tiernan Locke with that of Charly Wegelius for example. If Cookson is unable to make progress on lifting the Omerta that still exists around doping during his presidency he may end up being viewed as much of poor steward of the sport as McQuaid. He will require the cooperation of the riders and the teams along with the former players, but earning that is what being a politician and administrator is all about surely? He has at least shown signs of increased support for women’s cycling with the appointment of Tracey Gaudry to Vice President. The introduction of a 2.1 category women’s Tour of Britain from 2014 offers the prospect of a more equal footing for the women’s professional peloton, but more needs to be done to deliver marquee events alongside the men, with a high profile stage race in France being the obvious example. Next Next post: Lance.. Are we done yet?